Nevermind all the talk of fuel efficiency mandates. Judging by product rollouts at recent auto shows, some consumers still want racy, stylish cars. And automakers aren’t hesitating to build them. Call them dream cars. Chevrolet launched one at the North American International Auto Show in January: Its powerful new 2014 Corvette Stingray. Not to be outdone, McLaren Automotive rolled out the new hybrid P1, and Lamborghini introduced the high-powered Veneno at this week’s Geneva Motor Show. We call them dream cars for good reason. The 2014 Stingray is rumored to have an expected pricetag of $55,000, which is dreamy enough. But the McLaren P1 — with only 375 units in production — will run $1.15 million. 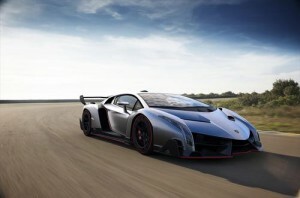 And the Veneno — possibly the ultimate in automotive exclusivity — will cost $3.9 million. Only three will be built.